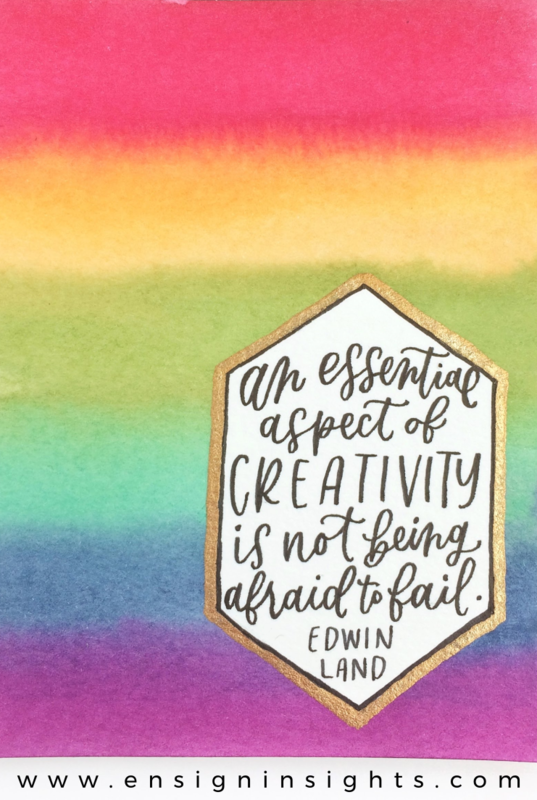 How can you be more creative in your art and lettering? You’ve heard of pop rocks right? But did you know they were made by accident? 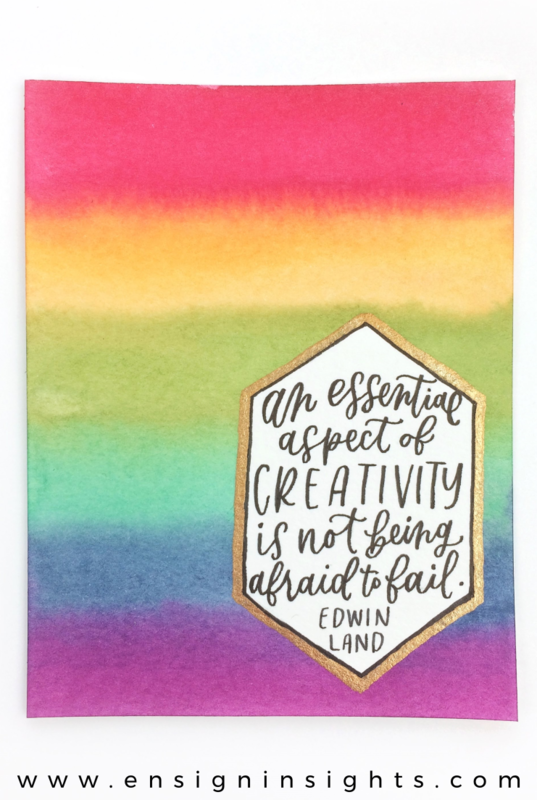 In this post, we’re going to learn from Pop Rocks how to be more creative in our art and lettering. 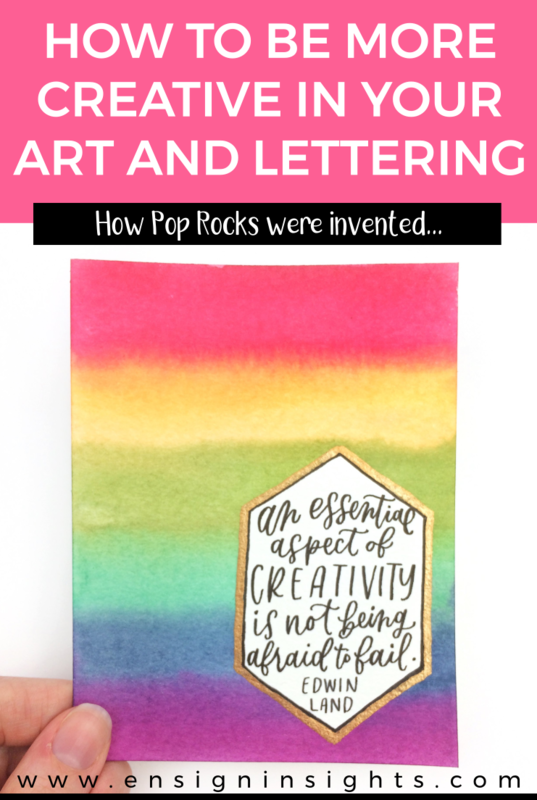 I have 3 specific ways to be more creative, and I’ll start with the story behind Pop Rocks. Here is the video of me creating this piece and explaining the story. I even show you Pop Rocks in action (feeling totally ridiculous recording myself eating candy!). I’m going to share the quick version of this story, see the full story on the travel channel here. In 1956, William Mitchell worked for General Foods making instant foods. He made Koolaid (a sugary, flavored drink which is still popular today), but they were trying to compete with Coca Cola’s carbonated drinks. Mitchell was trying to make an instant carbonated drink. He actually made a product called Soda Burst that could be stored in your freezer until you mixed it with water and chocolate syrup (carbonated chocolate milk? That doesn’t sound appetizing..). However, it only worked if you kept your freezer below 14 degrees Farenheit, and most stores did not. It didn’t take long for them to discontinue this drink. It was a huge failure for Mitchell. Because he had been experimenting with an instant, carbonated drink, Mitchell also happened upon Pop Rocks. He had some of the carbonated crystals on his fingers when he was eating, and he noticed that exciting popping sensation. He knew this could be a great product. But the people at General Foods weren’t sure about it. They didn’t start selling Pop Rocks until 1975 (almost 20 years later!) and it was a big hit! They sold 2 billion packets of Pop Rocks and they’re still selling it today. So what can we learn from how pop rocks was invented? How does this help us to be more creative in art and lettering? Do you ever see someone’s art and think, “I wish I could be creative like them”? Well guess what? You can. You may create something that they hadn’t even thought of. 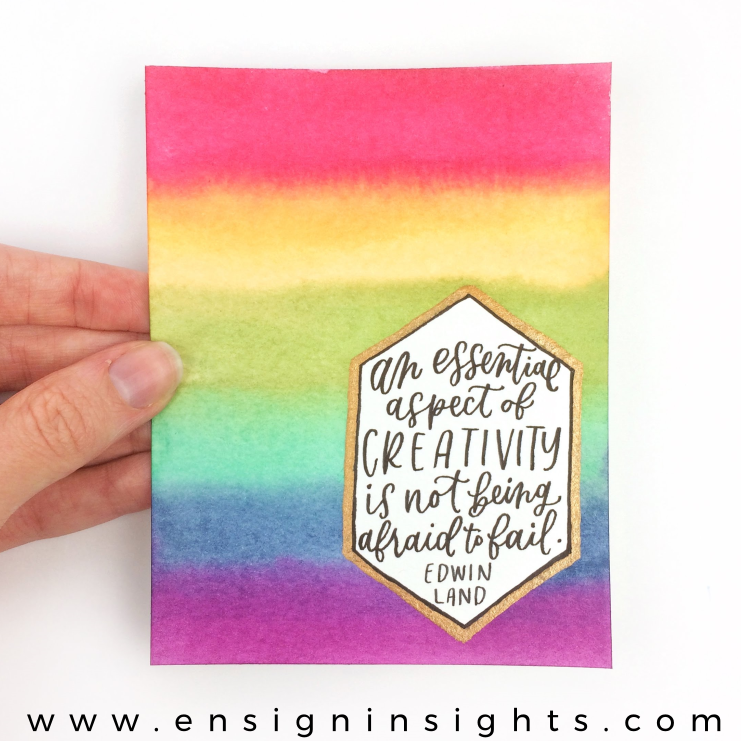 I have 3 specific ways we can apply this to our creativity. When we’re curious about how things work, it may give us more ideas. Why does someone’s lettering look that way? Why did they add that certain element? Is there another element I could add? 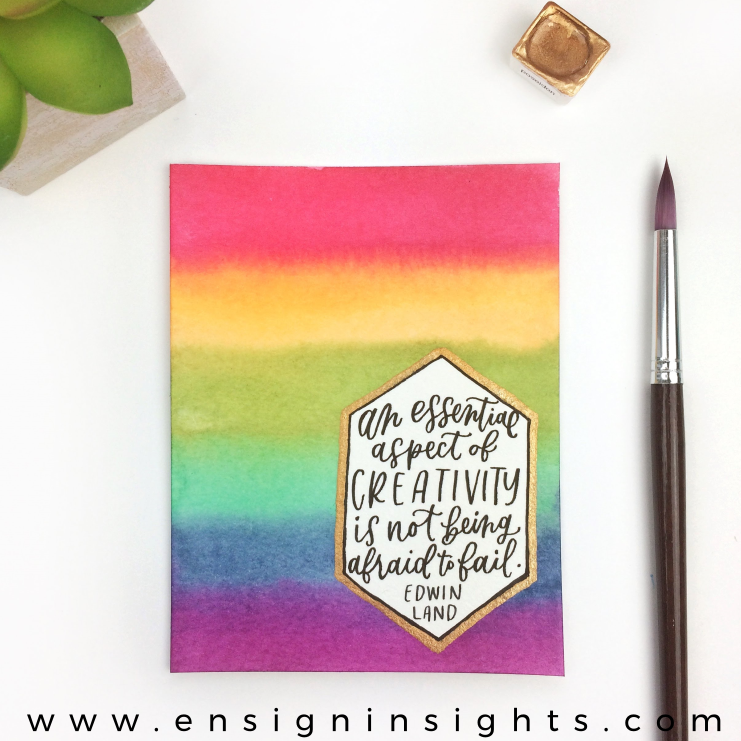 What happens if I blend certain colors? Is this done? Does it seem like a failure? Is there something else I can do with it? Realize that there is no right or wrong answer to these questions either. It’s your creativity. Try answering your questions in different ways. Second: Notice common problems and try to solve them. Mitchell was trying to solve the problem of making an instant carbonated drink. It didn’t work, but he found something else because of it. We have lots of things that could be problems in our art and lettering. For example, the problem of letter connections. It’s not like there is one person out there with the only possible way to do it. You can get ideas of how other people do it, but you don’t have to stick with that. Come up with your own. Solve the problem in a different way. You may be surprised how much you like it. Third: Don’t be afraid to fail. Finally, Mitchell figured out that it was really cool to eat carbon dioxide crystals that pop in your mouth. Technically that was a failure because it wasn’t a carbonated drink. His actual carbonated drink was a total failure, but it brought him to Pop Rocks. We have setbacks and some things really don’t work. But that shouldn’t scare us from continuing to try new things, because who knows what your next experiment or failure will lead to. 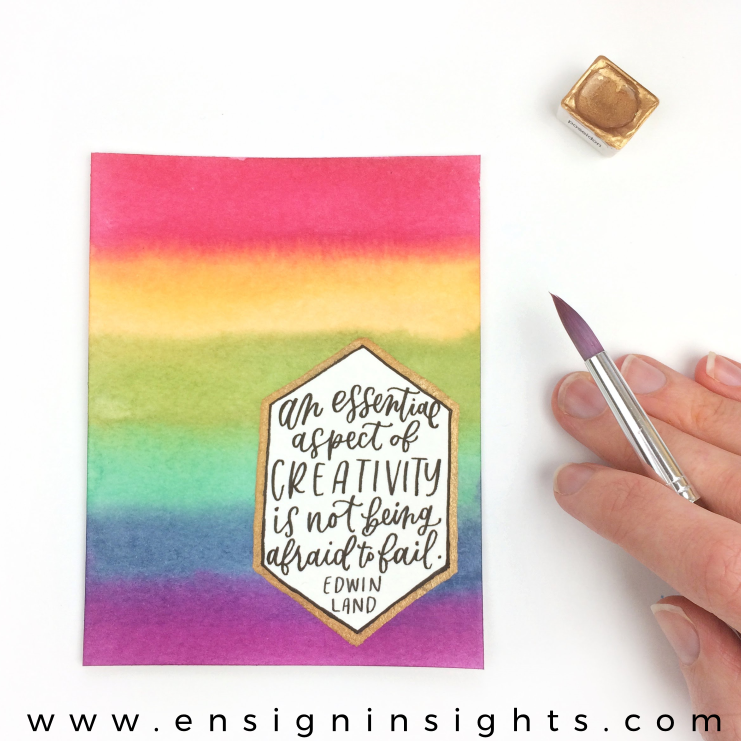 What helps you to be more creative? If you liked this message, be sure to pin any of these images on Pinterest and share with a friend!